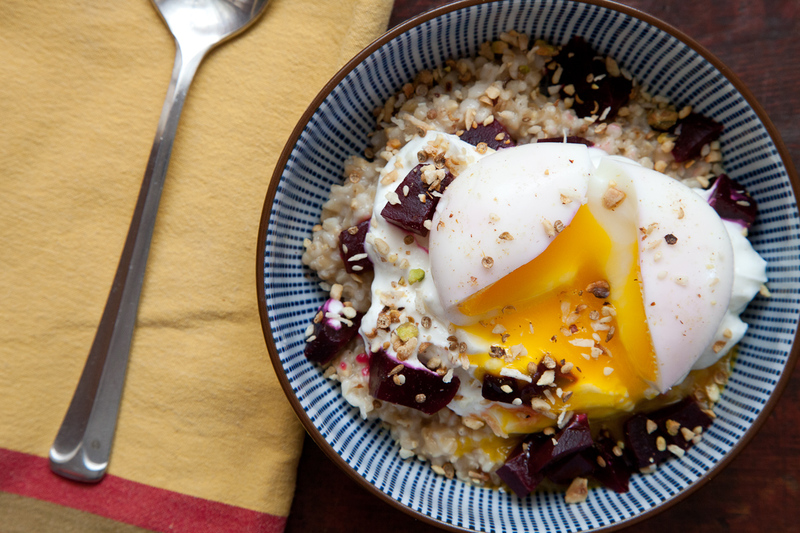 This entry was posted in Breakfast, Easy, Leftovers and tagged beets, dukkah, eggs, oats, soft-boiled, yogurt. Bookmark the permalink. I am a huge fan of this savory – grain – breakfast thing. Of course, I will eat just about anything with a perfectly poached egg on top! I recall being at a dinner at Rialto a few years ago, and Gordon Hammersley making some comment about Jody putting dukkah on EVERYTHING!! But it makes just about everything better :) Alas, no dukkah in my bare cupboard, but I may do the steel-cut oats with a poached egg for my pre-ride breakfast. Pingback: Quickie: Before and After « Enter, Fitness! I love this sort of breakfast: a power breakfast! I thought I was crazy for having my oats with eggs! Nice to know I have company. I usually also have some coldpressed oil ontop. Jujube-dates (red dried chinese dates) are really tasty with oats as well, they have a nice spicy “rasin”-like taste, but more spongy and foody (although I don’t know how to get my hands on new ones when I’ve eaten up the ones at home! Another trip to China, perhaps, so I can by more jujube dates).